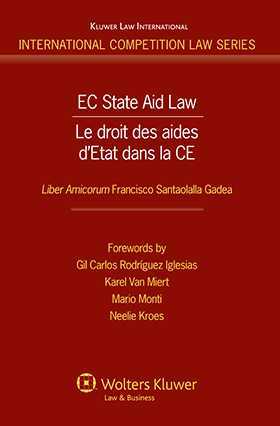 A uniquely important contribution to the debate on EC State aid, this book captures the direct knowledge and experience of twenty-six current and former Commission State aid litigators, offering detailed ‘insider’ analysis of EC State aid court cases, as well as related internal legal issues, between 1994 and 2008. The book brings together both legal and economic analysis, with detailed reflections on aspects of both substantive legal rules and procedural law. It also offers, over and above the specific interest of the contributions it contains, invaluable insights into the working methods of the Commission Legal Service. This collaborative work was conceived and realized by its authors as a mark of recognition, and a gesture of respect and friendship, for Francisco Santaolalla, on the occasion of his retirement from the Commission after fourteen years’ service as Director of the State aid team. In illuminating the underlying issues, and describing how they are handled by the Commission Legal Service, the authors shed light on the likely future development of State aid law. The book will be of particular interest to antitrust practitioners as well as academics. Forewords/Avant-propos; G.C. Rodríguez Iglesias, K. Van Miert, M. Monti, N. Kroes. Preface. Préface. 1. The Limited Role of the ‘Refined Economic Approach’ in Achieving the Objectives of State Aid Control: Time for Some Realism; J.L. Buendia Sierra, B. Smulders. 2. Economic Analysis and State Aid Law: The Questions Lawyers Need to Ask; P. Nemitz. 3. Quelques aspects institutionnels du droit des aides d’Etat; V. Di Bucci. 4. State Resources and PreussenElektra: When Is a State Aid Not a State Aid? H. van Vliet. 5. Pier Pressure: The Sad End of a Victorian Masterpiece? J. Flett. 6. The Private Market Investor Principle: Reality Check or Distorting Mirror? N. Khan, K.-D. Borchardt. 7. La sélectivité régionale; C. Urraca Caviedes. 8. La procédure de contrôle des aides d’État peut-elle être utilisée pour contrôler la bonne application d’autres dispositions de droit communautaire? C. Giolito. 9. Export Aid and EC State Aid Control; B. Martenczuk. 10. Finding the Right Balance: State Aid and Services of General Economic Interest; J. L. Buendia Sierra. 11. An Ecotax under the State Aid Spotlight: The UK Aggregates Levy; J. Flett, K. Walkerova. 12. Privatisations et déréglementations en droit communautaire; A. Abate. 13. Godot is Here: Recovery as an Effective State Aid Remedy; E. Righini. 14. The EC Rules Concerning Existing Aid: Substantive and Procedural Aspects; G. Conte. 15. The Temporal Application of State Aid Rules; V. Di Bucci, A. Stobiecka-Kuik. 16. Third Parties in State Aid Control: More than Just a Source of Information? M. Niejahr, T. Scharf. 17. Some Thoughts on the Jurisprudence of European Courts Concerning the Admissibility of Actions against State Aid Decisions; V. Kreuschitz. 18. Quelques considérations sur le rôle du juge national dans le contrôle des aides d´Etat; J.-P. Keppenne, K. Gross. 19. La fiscalité façonnée par la discipline des aides d’Etat; D. Triantafyllou. 20. L’application de la discipline des aides d’Etat: la quête judiciaire d’un nouveau graal; G. Rozet, B. Stromsky. 21. The Relationship between WTO Subsidies Law and EC State Aid Law; J. Flett, A.C. Jessen, K. Talaber-Ritz.